The best way to keep track of donations is by creating a General Ledger Code (GLC), which can be scanned each time someone adds the $1 to their bill. To ensure all staff know about the BrainLove Campaign, tape the Instruction Card on your till or on a common Staff bulletin board. If you do not want to participate, but would rather give a donation to the BrainLove Campaign, you can make a cheque out to the Saskatchewan Brain Injury Association. It can either be submitted directly to the organization via our mailing address, or through your local Saskatchewan Royal Purple Association Lodge. 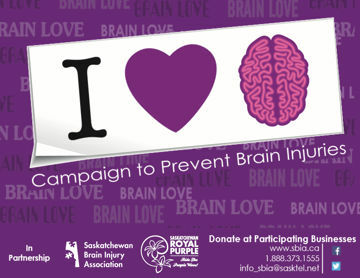 When you provide your collection to your local Saskatchewan Royal Purple Association contact, please give them all remaining BrainLove Stickers, the Business Instruction Card, and the BrainLove Poster.